The poinsettia is actually a tropical species that prefers year-round temperatures above the freezing mark in order to survive. Under ideal growing conditions and in its native sites, the plant can reach shrub-like proportions of 10 feet or more in height. However, we are most accustomed to seeing the plant magically appear in garden centers and other retail outlets as the Christmas holiday season draws near! And, indeed, the bright red and green contrasting colors (sometimes pale-yellow and softer greens and pinks) of the poinsettia plants have become an expected part of traditional holiday decorating. With proper care, poinsettia plants can be coaxed into producing beautiful blooms again each year right around the Christmas holiday. 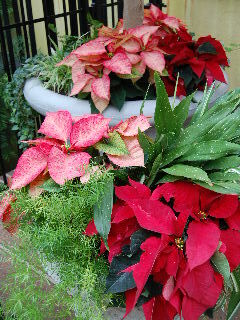 Many people give and receive the colorful plants each Christmas. The happy recipient of the beautiful new flora provides proper care by keeping the soil evenly moist and by placing the potted plant in a sunny window. However, after a few weeks, disillusionment sets in for those unfamiliar with the natural cycle of the poinsettia, as the plant begins to drop its leaves (generally from the bottom of the stems working upward) even though the owner has provided lots of poinsettia TLC. Don’t despair, plant lovers; the poinsettia is merely entering its natural resting period after it has bloomed! By taking a few basic steps from this point onward, you can allow your sleepy plant to get a good winter nap and then bounce back in the spring on its way to another colorful Christmas holiday! As the leaves begin to drop, start watering the potted plant less and less until you have finally stopped watering it all together and have allowed the soil and plant to completely dry. When all the leaves have dropped and you have “dried out” the plant, store the potted poinsettia plant in a cool dry place (maybe the garage) until spring. No maintenance is required at all during this time period. As the month of May arrives, carefully lift the dormant plant from its container and repot your poinsettia in fresh potting soil. Cut the stems of the plant back to a height of about 6 to 7 inches, making sure that each stem has 2 or 3 buds on it from which the new growth will emerge. Water the plant well and place it outside in a sunny location. One trick to accomplishing this, and still being able to bring the potted plant back indoors in the fall, is to sink the pot into a sunny flower bed and surround it to the container’s top with mulch. Keep the plant moist throughout the summer, give thanks for the gift of sunshine, and watch the poinsettia produce lots of healthy new branches and leaves throughout the summer growing season. As temperatures start to cool in the fall (but not down to freezing! 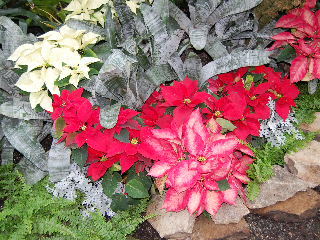 ), lift your poinsettia from the garden, pot and all, wipe off the outside of the container, and bring the plant indoors. Locate the plant in a sunny window or other indoor spot that receives lots of sunshine, and be sure to give it plenty of moisture (have we mentioned this thing about sunshine and moisture enough?!). If you’ve been a good little gardener all year long (and remember Santa’s always watching! ), you should be rewarded with a colorful flowering poinsettia, much like the one you received as a gift last year, just about the time Christmas rolls around again! If you want to be really bold and start some new poinsettias of your own, this can be done from the top cuttings you take in the spring before you repot your dormant plant for the summer. Place the bottom ends of the cuttings in wet sand; keep them moist and in a sunny location until roots start to form, at which time the new young plants can be set into pots. There now—in the space of one page, you’ve become a knowledgeable year-round poinsettia expert. Happy holidays, gardeners!